Use the Download menu below to access a printable PDF of the full text, or download individual chapters by theme or region. Read the global press release, the Africa press release and the South East Asia press release. Natural resource development projects such as logging and dams, oil and mineral extraction and large-scale agriculture have been successful in generating vast revenues across the globe. But at what cost to minorities and indigenous peoples? 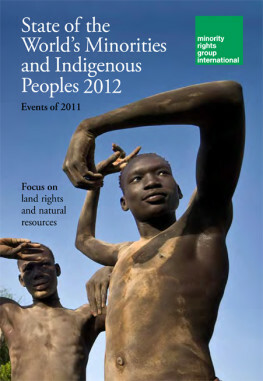 In its flagship annual publication, State of the World’s Minorities and Indigenous Peoples 2012, MRG documents hundreds of case studies about marginalized groups who have been adversely affected by exploitation of the resources found on, or under, their ancestral lands. It also considers land rights around the world. Discussions on issues such as women’s land rights or corporate responsibility to protect human rights. An examination of the growing body of legal standards and jurisprudence in the area of indigenous peoples’ rights. Interviews and case studies from minorities and indigenous communities, including examples of how they are fighting back and campaigning to protect their rights. Overviews of the human rights situation of minorities and indigenous peoples in every major world region. Peoples under Threat 2012 – MRG’s unique statistical analysis and ranking of countries. An invaluable reference for policy makers, academics, journalists and everyone who is interested in the human rights situation of minorities and indigenous peoples around the world. Find untold stories from minorities and indigenous peoples affected by natural resource extraction and land rights issues in the Minority Voices Newsroom. Follow MRG on Facebook and Twitter.